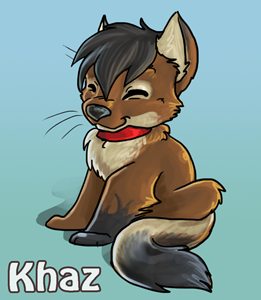 Khaz is a cross-breed wolf born, raised and living in Ontario, Canada. In his spare time he enjoys playing the piano, solving Rubik’s cubes and of course, writing. While words have come naturally to him all his life, it wasn’t until early 2006 that Khaz began to take writing seriously. On a rainy day in May, he began writing a novel that would take two years to complete. While that hideous novel remains collecting virtual dust on his hard drive, unread by anyone but himself, the endeavor inspired many smaller projects that reside on his FurAffinity page. Now and in the future, Khaz is resolved to write whatever his muse may dictate, regardless of what audience it may cater to. What he will make public may well be different story. To date Khaz has had three stories published: “Learning to Live” and “True Color,” which are featured in Sofawolf Press’ Heat #6 and #9 respectively, and “Al Coda,” which appears in Bad Dog Books’ ROAR #3. The remainder of his written work can be found on his FurAffinity page.